Joseph Phelps — who more than four decades ago put his faith in the future of Napa Valley wine in launching a second career — died Wednesday at his St. Helena home at the age of 87. In the late 1960s, Joseph Phelps was running the largest construction companies in Colorado founded by his father — Hensel Phelps Construction Company in Greeley, Colorado — when he won the bid to build Souverain Winery (now Rutherford Hill) on a hillside east of Silverado Trail. 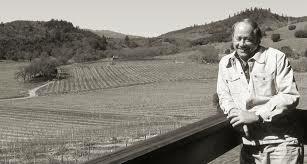 Enamored with the Napa Valley and contemplating a career change, in 1973 he bought a 600-acre cattle ranch in Spring Valley, and began planting vineyards and construction of a winery. The first harvest in 1973 yielded cabernet sauvignon, pinot noir and Johannisberg riesling bottlings, all custom crushed at nearby wineries. The Joseph Phelps Vineyards was completed in 1974 in time for harvest, crushing grapes for the first Insignia, the winery’s signature Bordeaux blend that would receive worldwide acclaim. That wine, Phelps landmark line of Rhome wines and other bottlings put Joseph Phelps Vineyards on the valley’s map of top wine producers. Phelps gradually divested his interest in the family’s construction company, selling it to his employees. “He was one of the valley’s pioneers,” Margrit Mondavi said Thursday after learning of Phelps’ death. “Together with Robert Mondavi and others at the time, they put their hands in the soil and their souls in the wine, creating what we have today. Joseph Phelps crafted a style of Napa Valley wine that can be enjoyed for a long, long time.